Rich and famous actor, Jamie Foxx is notable for a lot of things. He is an actor, musician, comedian, producer, and songwriter who has continued to stay on top in showbiz. How did he come to this level? It may seem difficult to decipher but consistency and drive are the factors that have kept the diverse entertainer afloat in the challenging business of entertainment. Foxx has garnered a lot of accolades in the course of his career and he has his outstanding craft to thank for it. Jamie Foxx was not always in the limelight; like most of his counterparts, he had a humble career beginning. He was born Eric Marlon Bishop was not that fortunate to grow up with his parents, whom after their divorce gave him to his maternal grandparents. Being away from his mother and father didn’t stop young Jamie from discovering his talent. He started out by playing the keyboard at age 5 and was good at telling jokes, which he used to entertain his peers at school. Unknown to him, this was the path he would not only choose but the path where his distinctiveness would be fully actualized. After his high school in Terrell High School, he proceeded on a scholarship to the U.S. International University in San Diego where he studied music. He took the first step into his career in college when he was persuaded to take up the microphone in a comedy club. The crowd he pulled with his performance that night encouraged him to do more and Foxx never felt more driven to pursue his dreams. Scouting for entertainment platforms after college, he landed a role as a cast on Fox’s In Living Color and the rest was history. In 1996, he went on to start his own eponymous sitcom “The Jamie Foxx Show” which was a big hit at the time. He remains unforgettable for his role in 2006 hit movie Dreamgirls, where he co-starred with Beyonce and Jennifer Hudson. Jamie Foxx is indeed a fox in the wild jungle of worldwide entertainment. Basking in an enviable net worth estimated at $100 million, Foxx is nowhere close to being ordinary in the business. From his first movie role as ‘Baker’ in comedy Toys (1992), as well as his first music album ‘Peep This’, he has continued to soar to greater heights and has several awards and accolades to show for it. Included in his pool of achievements are truckloads of awards and nominations ranging from the Grammies, BET, Golden Globes, BAFTA, Academy and many others. For his role in the movie, Ray, Foxx won the Golden Globes award for Best Performance by an Actor in a Motion Picture – Comedy or Musical in 2005. He was also nominated for Best Performance by an Actor in a Miniseries or a Motion Picture Made for Television under the same platform that year. 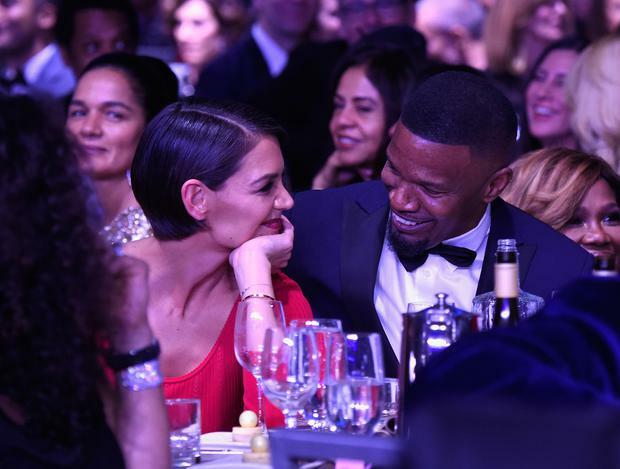 After years of hiding from the prying eyes of the media, Jamie Foxx and Katie Holmes are gradually coming out with truths about their relationship. While the media continues to long for an informative tip into their relationship, the duo still seems to be tight-lipped. However, as the adage; nothing is hidden under the sun goes, Foxx and Holmes may have dished little tips about their love life. This is with regards to the very many appearances they have made together which in all ramifications portray a ‘couple in love’ or something pretty close to that. Katie Holmes who was once married to actor Tom Cruise was gradually lined to Foxx a few years after her divorce from Cruise in 2012. There was no suppressing the romance buzz that flooded media platforms, especially as Tom Cruise and Jamie Foxx, were regarded as friends or friendly colleagues. The buzz, rumors, and speculations as the case may be continued until 2017 when Foxx and Holmes were spotted together in Malibu in September that year. Since then it’s been one appearance after another. Although the two have still not made assertions about their relationship, Katie would not miss Foxx’s 50th birthday party feeding the public with more reasons to maintain that there’s something going on. Jamie Foxx fathers two biological daughters from his past relationships; Corinne Foxx and Annalise Bishop. With these on and off relationship tales about Foxx and Holmes, as well as his previous relationships, it is hard to think that Jamie is gay as speculated by some sources. Some have thought that if the actor has not summoned the courage to go public about his love life then it could mean that he is gay. But then again it’s all left for the entertainment mogul to confirm. Jamie Foxx takes no chances when it comes to his looks. Looking good is indeed good business for the versatile actor who still follows his workout schedule. Weighing 82 kg, Foxx takes his workout seriously in order not to go out of shape. He stands at an average height of 5ft 9in which is quite proportional to his body weight. The actor whose waist measures at 33in has a broad chest measured at 43.5in. Having such good features at such an advanced age, there is no going back for Foxx.